Mention the word email, and you’re likely to see any group of seasoned executives cringe. Ask them how many messages they sort through on any given day, and they’ll surely shake their head in despair. It seems that no one is safe – not even the most organized and structured professionals among us – from the digital black hole we know as an inbox. For years, new applications, experts and researchers have been predicting the impending death of email. Yet here we are, over 50 years after its inception, and e-mail is still going strong – while successfully eating up countless hours of work and productivity. So what is an effective manager to do? In between business meetings, managing organization initiatives and, you know … running a company, how are you supposed to tackle this problem? By doing one simple thing: take back your email inbox. Here are a few simple email solutions to help you on your journey to zero emails in your inbox. 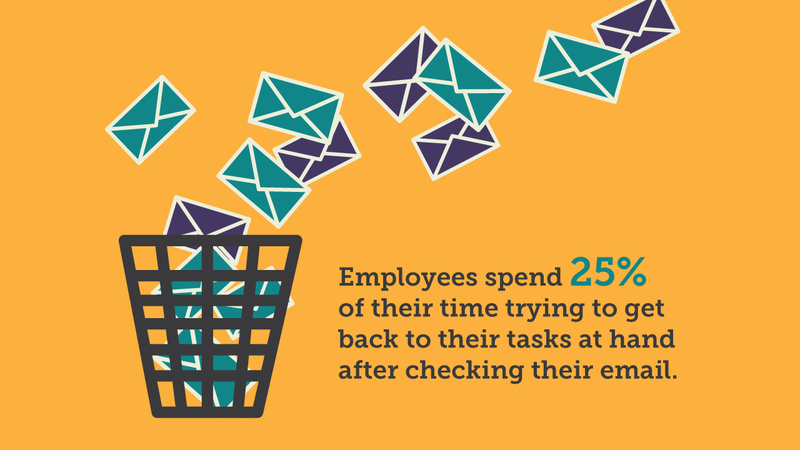 Did you know that the average employee checks email 36 times per hour? They’ll spend 16 minutes per hour refocusing on tasks that were interrupted by all that email checking.1 That means 25% of their time is spent trying to get back to the original tasks at hand! Why does this happen? It’s often a side effect of email overload – receiving too many email notifications and subscribing to too many recurring emails (usually due to a fear of missing out on important news or information). The goal is to get out of the email overload rut and back into a productive relationship with your inbox by rolling up your sleeves and attacking it systematically. But first, you have to start with cleaning out what’s already there. The objective here is to eventually have an empty inbox. The key to managing it once it’s empty will be to keep it that way. For starters, you’ll need to get all those emails that don’t need a reply – whether you’ve read them or not – out of your inbox and into folders. Start broadly with your folder system – such as creating a 2014 folder and moving everything in there before sorting more topically. Then, delete all emails that are irrelevant, outdated or not important. In addition, take a hard look at your email addresses; can you manage them all from the same inbox to increase your efficiencies? Are there any that you can retire? An updated contact list can save you hours in future correspondence. Once you’ve gotten all the non-urgent emails out of your inbox, it’s time to take a look at those that still require your attention. These are your top priority emails. But here’s the kicker: just because they need attention doesn’t necessarily mean that you have to be the one replying to all of them yourself. Assess the types of top priority emails you have, and see if they fall into specific categories. For instance, perhaps they really have more to do with sales, company policy or customer support. Or maybe they involve scheduling or meeting planning Then ask yourself if there is someone else on your team who is better-suited to respond. If so, delegate those emails to the appropriate team members and move on. Make them easily-skimmable for action items. If a topic starts generating lots of back-and forth, hop on a chat or a quick video conference instead of engaging in another round of email replies. By following these simple tips, not only are you managing your email inbox, you’re helping others keep their inboxes manageable as well. Your inbox is an always flowing stream of incoming interruptions. If you allow incoming messages (and those constant “dings”) to drive your daily activities, you might not ever get your work done, let alone increase your productivity. But once you commit to keeping a clean email inbox, and minimize your reliance on email for project management activities and discussions better suited for live conversation, you’ll find you’re spending less time triaging the flow of emails and more time focusing on your work. Share these tips with your social networks to help your friends and colleagues conquer their email inboxes, and leave us your best email tips in the comments. 1Kemmitz, Bryan. “Measuring Information Glut Applying Systems Thinking to the Problem of E-mail Overload”. Master’s Thesis, Naval Postgraduate School, 2012.